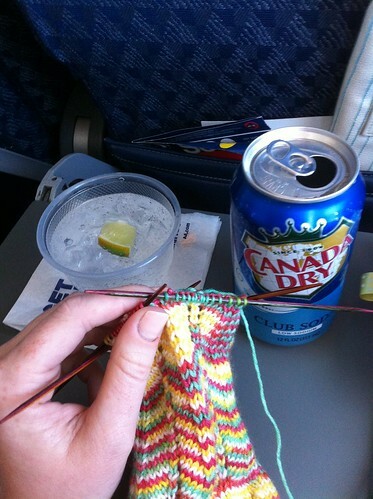 In one of her many books and/or blog posts, the Yarn Harlot wrote, years ago, about the belief that knitted items somehow "soak up" the vibes that surround them while being knit. This is sort of the idea behind prayer/comfort shawls and really, all items we make for dear friends and family. Steph said something about how this worried her, though, because there was often a lot of frustration and cursing surrounding her knitting, and she didn't want that to be transferred to the recipient, haha. Tiny, tiny, beyond minuscule annoyance, but something I've noted. 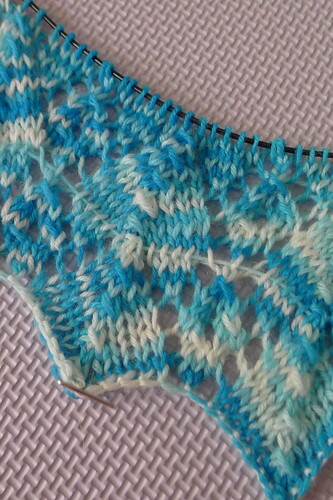 I'm through the three repeats of Chart A on that shawl (the Lila pattern) and still have a good bit to go. I have to finish it in about two weeks...wish me luck! 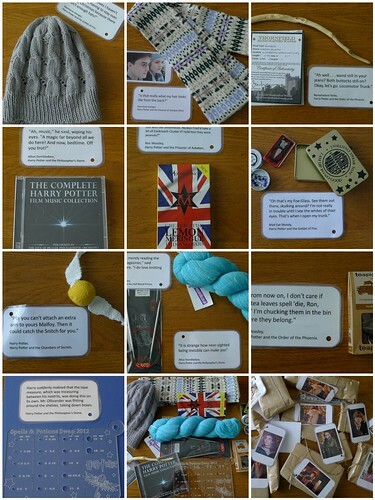 Each individual gift had a character card with a quote that tied to the present--how perfect! 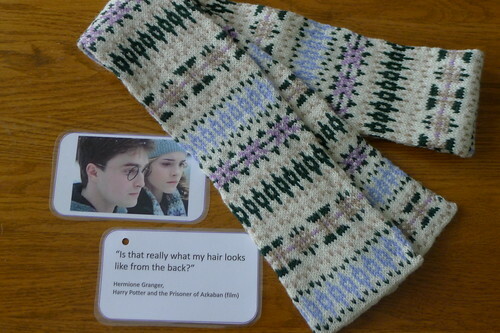 It's a perfect replica of the one Hermione wears in the later films, and I love it so much! What's extra cool is that my spoiler sent along the ball bands from the yarn that she used to knit it, which means that I can match the colors exactly and make the matching mittens--awesome! But since I want them to look as great as the scarf, I feel like I ought to practice stranded knitting first on some easier projects. Any suggestions? 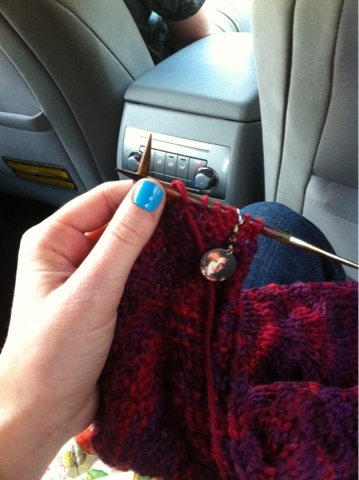 Wordless WIP Wednesday: Mobile Edition! 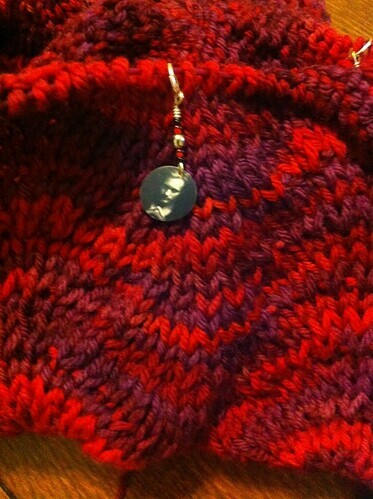 Oh that's right, I am crocheting for you, for your graduation present. Not my favorite, but the best way to make what you want--so it's worth it! It's strange...I've known how to crochet for probably six or seven years now, but I always choose knitting when possible. 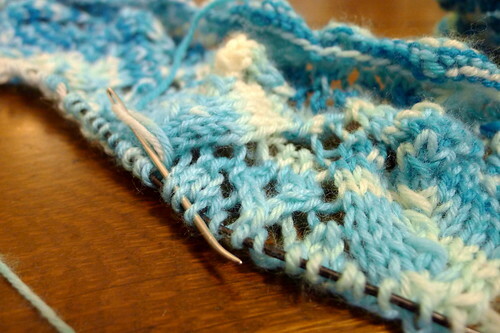 Crochet seems rougher on my wrists, and slower. What's your preference, and why? 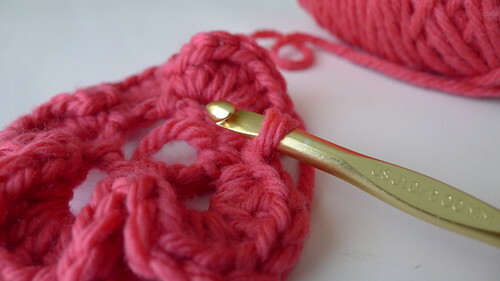 Welcome to Ashpags Knits on Blogger! 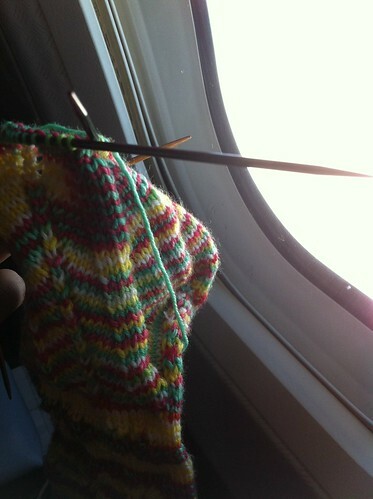 I write about yarn and knitting, with occasional tidbits on life as an astronomy grad student. I don't blog very often, but if you subscribe via RSS or email using the links just below this, you'll never miss a post! This is a Flickr badge showing public photos from ashpags tagged with FOs. Make your own badge here.